Particulate matter pollution is a serious environmental problem. Individuals exposed to particulate matters have an increased prevalence to diseases. In the present study, we performed an epidemiological study to investigate the effects of particulate matter less than 10 μm in aerodynamic diameter (PM10) and particulate matter less than 2.5 μm in aerodynamic diameter (PM2.5) on allergic rhinitis in Nanjing, China. Daily numbers of allergic rhinitis patients (33,063 patients), PM10, PM2.5, and weather data were collected from January 2014 to December 2016 in Nanjing, China. Generalized additive models (GAM) were used to evaluate the effects of PM10 and PM2.5 on allergic rhinitis. 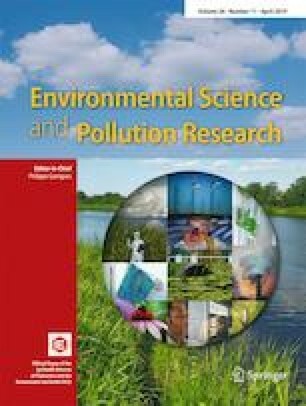 We found that the interquartile range (IQR) increases in PM10 (difference of estimates, 5.86%; 95% CI, 3.00–8.81%; P = 4.72 × 10−5) and PM2.5 (difference of estimates, 5.39%; 95% CI, 2.73–8.12%; P = 5.67 × 10−5) concentrations were associated with the higher increased numbers of allergic rhinitis patients with 3-day cumulative effects in single-pollutant model. In addition, we found that the IQR increase in PM10 (age ≥ 18 years: 7.37%, 3.91–10.96%, 2.14 × 10−5; 0–17 years: 0.83%, − 4.00–5.91%, 0.740) and PM2.5 (age ≥ 18 years: 7.00%, 3.78–10.32%, 1.40 × 10−5; 0–17 years: 0.40%, − 4.10–5.10%, 0.866) increased the number of allergic rhinitis patients in adults, but not in children. In summary, our findings suggested that exposure to PM10 and PM2.5 was associated with the risk of allergic rhinitis. Haiyan Chu and Junyi Xin contributed equally to this work. The online version of this article ( https://doi.org/10.1007/s11356-019-04593-5) contains supplementary material, which is available to authorized users. This study was partly supported by grants from the National Natural Science Foundation of China (81870733), the Natural Science Foundation of Jiangsu Province (15KJB330002), Undergraduates Training Programs of Innovation and Entrepreneurship of Jiangsu Province (201510312001Z), Collaborative Innovation Center for Cancer Personalized Medicine, and the Priority Academic Program Development of Jiangsu Higher Education Institutions (Public Health and Preventive Medicine). This study was approved by the institutional review board of Nanjing Medical University.